Do you have a lot of scarfs and no place to put them? I really like this tip, and I don't even have a lot of scarves! 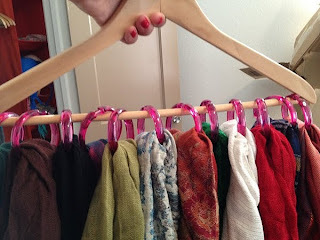 For a better way to organize your scarves, make yourself a scarf hanger using shower rings. 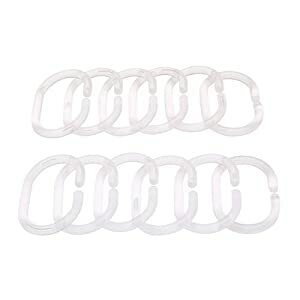 This will save on storage space in your drawers and in the closet and makes the scarves all easy to see and find! I bet you could use this for other things - like belts, purses, ties! Anyone getting any other ideas? 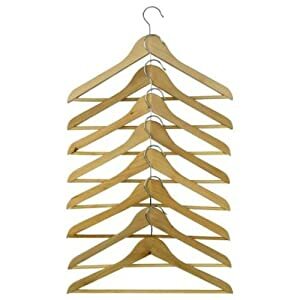 TIP: You could use a plastic hanger, but a wooden hanger would be sturdier. Jenny Brassfield-Mustin posted: Ummmm I'm thinking for my husbands ties!! Priscilla de Jimenez posted: Excellent idea!!!! Heather Minnich posted: Ah, something to do with all those old shower curtain hangers! Andrea Thomes McQueen posted: This would be great for all that extra fabric I have that is stuffed in bins. It's a chore trying to dig thru to find what I want. Thank you for the inspiration!! Mavis Stewart-Wofford posted: What a wonderful idea! Mine are hanging over the door looking messy! Theresa Pierce posted: I'm going to have to start buying/wearing scarves just so I can have a pretty hanger like this! Maisie Larson posted: What a cool idea! Angel Dedmon Bailey posted: Thanks for sharing....love the idea!